This is a set of ten paper minis with front and back art in 300 dpi. 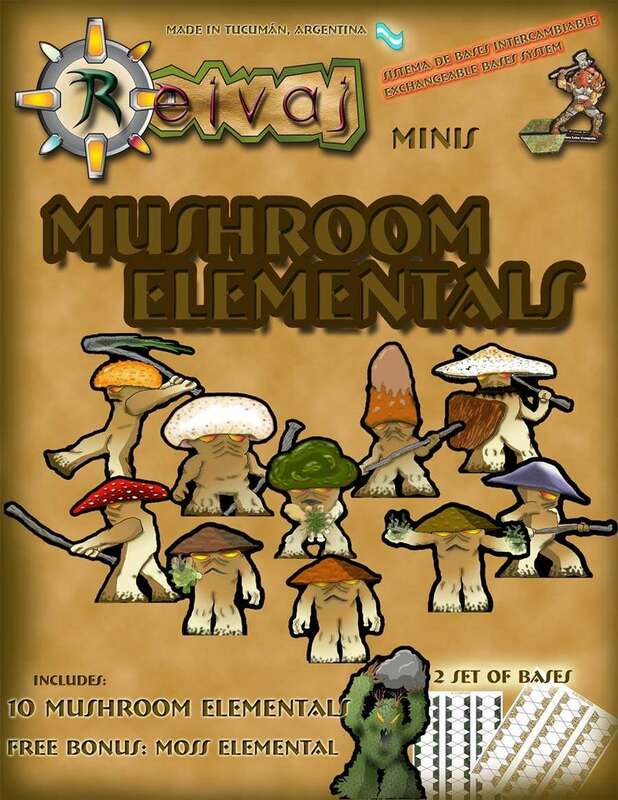 This set includes 10 mushroom elementals plus a free bonus moss elemental mini. The set also have two sets of bases hex (forest and grass) for the minis because they use the exchangeable base system so your minis may use different types of bases according to the place where your game´s set up. I do like them! A lot! In fact, I added it to my cart shortly after you added it to RPGNow (just waiting to clear up Mastercard's flagging of OBS charges). It's a very timely release, because while I took the plunge for the Reaper Bones II Kickstarter, I passed on an expansion set that included the mushroom men (partly because that was one of only a couple of pieces I wanted in it). Frankly, I like yours better than those sculpts anyway. Plus with yours I need not wait a year to get them, nor have to live with a far-from-perfect paint job once I do! I am making a cutfile for this today. Expect to see a LOT of these showing up in my Out of the Abyss game. I'll post a full "cutfile" post later. If you know what to do with this, have at'm. The content of this post will replaced in the future.